Many degree-seeking college students struggle academically and ultimately never graduate. Academic challenges and persistence within the major are especially salient issues for students who major in science, technology, engineering, and mathematics. Academic probation serves as a means for informing students that they are at risk of dismissal, and many colleges and universities offer services to help students placed on probation to succeed academically. 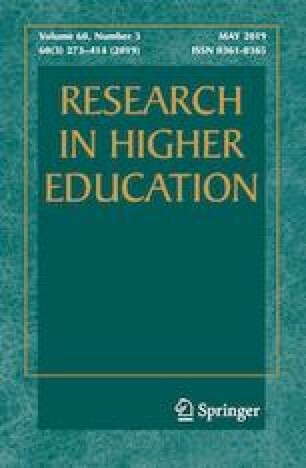 This paper presents two studies that examined the effectiveness of a goal-setting academic advising intervention for improving the grades of engineering students who were on academic probation; one study used a regression discontinuity design, and the other used an experimental design. The findings of both studies support the same overall conclusion: The intervention notably increased the grades of engineering students on probation who are beyond their first year of college, but it was not effective for students in their first year. This brief academic enhancement intervention appears to constitute a cost-effective strategy for bolstering the academic success of at-risk college students after their first year. The authors thank the students and faculty in the Center for Research on Undergraduate Education at the University of Iowa as well as Rocío Titiunik at the University of Michigan for their helpful feedback on this project. Business Roundtable & Change the Equation. (2014). Business roundtable/change the equation survey on U.S. workforce skills: Summary of findings. Retrieved from https://www.ecs.org/wp-content/uploads/2014-BRT-CTEq-Skills-Survey-Slides_0.pdf. College Transition Collaborative. (2018). Academic probation and the role of notification letters. Stanford, CA: Author. Retrieved from http://collegetransitioncollaborative.org/content/sass_toolkit_researchbrief_final.pdf. Varney, J. (2007). Intrusive advising. Academic advising today. Retrieved from http://www.nacada.ksu.edu/Resources/Academic-Advising-Today/View-Articles/Intrusive-Advising.aspx.